Neatly playing down its associations with one of the country's busiest motorways by overlooking the rolling hills of Worcestershire are two of the oldest buildings on the network. It won't win any awards for architecture, but it has a job and it does it. First two hours free for all vehicles, after which cars must pay £15 and HGVs, caravans and motorhomes £25.50. HGVs can pay £27 to include a £10 food voucher. Prices are paid using PayByPhone - more details. The location code is 2438 (northbound) and 2439 (southbound). Bright colours in the northbound services. It seems there will never be an end to the jokes about Frankley's name, especially as it's close to Rubery. 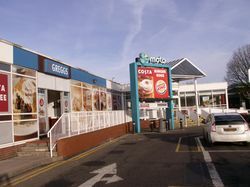 As of 2014, the nationwide downscaling of restaurants and retail shops had left the centre of the northbound services and the upper level of the southbound services largely boarded up, with Greggs and Burger King making up the majority of the trade. This is an interesting contrast with many nearby services, which had grown in recent years. On the northbound side, this was put right in March 2017 with a new M&S Simply Food store opening in the centre of the building. 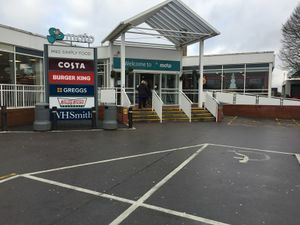 There were plans for a southbound Greggs here for several years before the forecourt gained one on 9 March 2017 and finally the main amenity building gained a Greggs kiosk outside on 12 January 2018.